This kicks off Swagger's journey through the looking glass and his attempt to understand the events of November 22, 1963. He travels to Russia and gets obsessed with Lee Harvey Oswald and his visits to Russia and Mexico. He pores over details about Oswald's life and the link back to the failed conspiracy that almost took his life in Point of Impact. 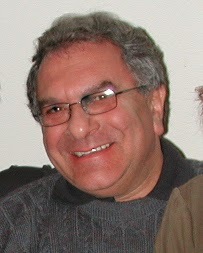 He has run ins with Russian organized crime and Russian counter-intelligence. 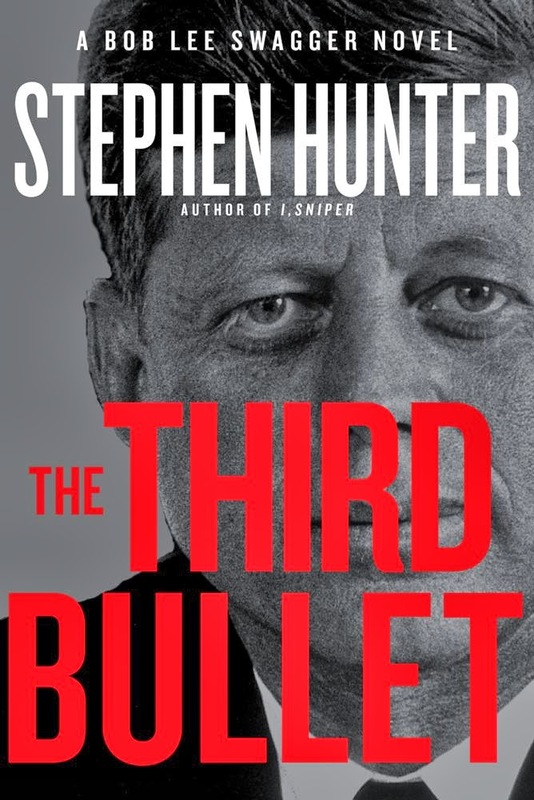 About halfway thru the book the POV switches to the Big Bad, who really was behind the JFK assassination, though perhaps not for the reasons that everyone thinks. He's aware that Swagger is on his tail. Having tangled with Swagger before, albeit at a distance, he takes steps to ensure that the truth never comes to light and that this time Swagger gets the permanent dirt nap. 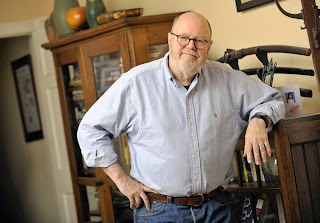 Perhaps in deference to Swagger's advanced age (he's in his late sixties by this point), the book is less of an action tale and much more of a detective story. Swagger knows he's not physically the man he used to be. The Third Bullet is also a hagiography of those skilled men who could shoot a quarter out of your hand at a thousand yards or throw a silver dollar in the air and hit it three times before it touches the ground. Hunter certainly loves them, good or bad and it shows. Swagger constantly complains of hip pain. He's been shot multiple times and walks with a noticeable limp. Once expansive muscle has withered away to stringy rawhide. But when the s*** gets real, old or not, Swagger still deals in lead. His "I'm just a dumb country boy" routine is getting a little long in the tooth but it still tricks some people into underestimating him. That's usually a fatal mistake. Just ask the bad guys in Point of Impact who told Swagger to drop his weapon or they'd kill his wife. Swagger agreed and said he'd put his gun down on the count of three. He started counting but shot everyone on the count of two. There are a couple of scenes like that here. 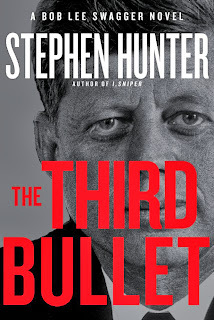 I don't think that Hunter believes in JFK conspiracy theories. The Third Bullet is dripping with Hunter's contempt for other conspiracy theories. As something of a conspiracy nut myself I thought Hunter was unfairly dismissive of some things. But YMMV. Hunter includes tons of detailed specialist information about guns, shooting and gun culture. Some questions about the events of November 22, 1963 will probably always be unanswered. But it's certain that you don't want to mess with Bob Lee Swagger. When we study history we often talk about the glories of the Roman Empire and the benefits of civilization that the Romans brought to the places they conquered. What was overlooked until relatively recently historically speaking, is that advanced civilization or not, subjects of the Roman Empire did not necessarily appreciate being conquered, having their cultures altered, being forced to pay tribute or being enslaved. There is a pretty good book titled The Enemies of Rome that is worth reading if you can find it. Some of these people attained an almost legendary status over the centuries, even if they lost in the end, as most indeed did. There's something about standing up against all the odds, knowing you'll probably lose and putting up your dukes anyway, that resonates with people looking for heroes or heroines. Hannibal of Carthage, Arminus of Germany, Vercingtorix of Gaul and Spartacus of Thrace were some famous leaders who resisted Roman expansion or enslavement. Though Carthage lost the Punic Wars, Hannibal's tactics are still studied in military academies. Arminus was later murdered by his own people but his destruction of Roman forces at Teutoberg Forest ended Roman attempts to colonize Germany. Vercingtorix remains a national hero for France. And everyone knows the story of Spartacus, who became an inspiration for slave revolts down thru the ages. But for pure style and tragedy none of these leaders could match up with Boudicca, Queen of the Iceni and leader of the most massive British revolt against Roman rule ever seen. Boudicca was married to King Prasutagus, leader of the Iceni, a Roman client state in the east of England. Upon his death, seeking to protect his wife and children, Prasutagus attempted to make the Emperor Nero co-ruler of his kingdom with his minor daughters. However the Romans had other ideas. 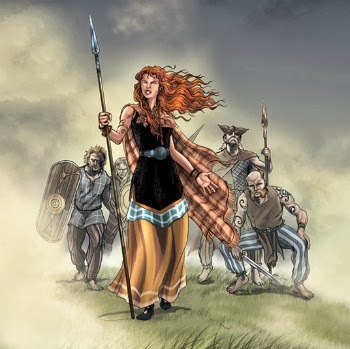 They seized all of Boudicca's property and informed her that henceforth the Iceni would no longer have semi-independence but would be a conquered/enslaved people like any other. The Roman philosopher/banker Seneca called in his loans to the Iceni, further impoverishing them. When Boudicca went with her children to the local Roman governor to protest this treatment, the Romans made an example of her. 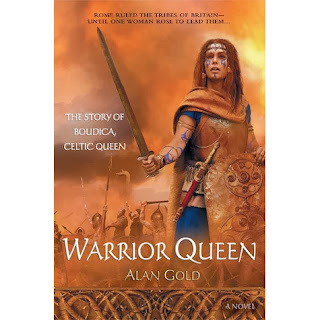 Queen Boudicca was publicly stripped naked, beaten and whipped into unconsciousness while her minor daughters were gang raped by Roman soldiers. But the Romans made one mistake. They left her alive. In short time Boudicca raised an army among not just the Iceni but various other British tribes. She became the most relentless executioner the Romans had seen. She exterminated an entire Roman legion, and sacked and completely burned down three Roman cities, including Londinium (London) and Camalondum (Colchester). Her stated intent was to drive all the Romans from Britain. She showed no Roman any mercy regardless of age, gender or combat status. Thousands of Romans were killed and many more fled overseas. Boudicca would have won if she hadn't made the critical mistake of attacking a Roman army on ground of its own choosing. Her largely irregular forces could not break the famed Roman cohesiveness nor withstand the deadlier Roman weaponry. And because they had foolishly brought their families along to watch their expected victory the Britons were hindered from fleeing the battlefield by the need to protect their loved ones. The Queen either died in battle or committed suicide to avoid capture. Before this last battle she gave a speech in which she listed all the various harms done to her, her daughters and Britain in general. She said she was only a woman but was willing to fight. She dared the men of Britain to stand with her. They did. This book is historical fiction with emphasis on the fiction part. It shifts among the various points of view of major characters, including Boudicca, her husband, the Roman emperors Claudius and Nero and the Roman general Suetonius, who was destined to defeat Boudicca. Warrior Queen also gives a nod to the fact that truth is stranger than fiction by briefly detailing the sexual misadventures of Empresses Messalina and Aggrippina. Cersei Lannister had nothing on Aggrippina, who married her uncle Emperor Claudius and had regular sexual relations with both her brother, the Emperor Caligula and her son, the Emperor Nero. Warrior Queen attempts an overarching view of Celtic life. It starts in Boudicca's childhood and drags at the start. Still, it's a quick read, if not a great one. The dialogue is a little flat. Boudicca is thought to mean victory. The closest modern equivalent is Victoria. There are some timeless arguments about the difficulty of deciding when to go along to get along and when to get up and stand up for your rights. There is some contrast described between the extreme Roman patriarchy and the Celtic relatively relaxed gender roles. Before the final battle General Suetonius gave a speech mocking this difference. The book does not shrink from describing unpleasant cultural practices of both peoples, especially the habit of deliberate Roman atrocity. In this telling Boudicca is fully aware of her relative amateur military tactician status. She utilizes the Romans' arrogance and sexism against them.